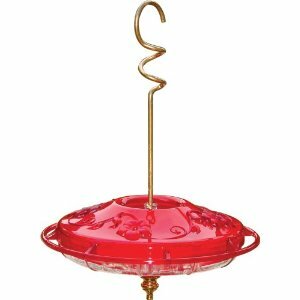 Choosing the best humming bird feeder gives me hours and hours of huge enjoyment while I watch wild birds in my garden. On this page you will find humming bird feeder facts to enhance your understanding of these gorgeous birds, humming bird feeder recipes and my best humming bird feeders. Not only do humming birds enjoy the humming bird nectar recipe that I use, also sparrows, weavers, bulbuls, cape white eyes and mouse birds fight for a place on my humming bird feeder. If you have not tried to feed humming birds in your backyard before, you are in for a treat! These little creatures provide hours of entertainment for any bird lover. Make sure that you include plants for hummingbirds in your garden. Having flowers that attract hummingbirds to your garden will help them to find your feeders... All adds up to more hours of enjoyment for you! A great way to use flowers for attracting Hummingbirds is to plant them in hanging baskets. Try red Petunias and red Fuchsias in your baskets, they grow easily and make a nice show. Place the baskets where you can easily see them. Include pots around your porch and windows to bring these little wild birds close to your windows. Also makes it easy to replant when necessary. Hummingbirds (and most other garden birds) love water. Hummingbirds prefer moving water such as sprinklers, fountains and drippers. Give them a spray and watch them fly through the water to cool off. keep the water sources fresh and clean, and position the water near your hummingbird flowers to make it even more attractive to hummingbirds. I have seen these little birds swish around in the water left behind on big leaves in my garden after watering. They do seem to prefer to flutter under a shower, rather get into a pool for a proper bath. Spider webs are a big favourite with hummingbirds. They will see the spiders in your garden before you do. They eat insects from the spider webs and use spider silk for building their nests. So don't use insecticide in your garden! It is bad for the hummers, bad for the soil, bad for other birds! Try other methods for controlling garden pests. The fancy hummingbird feeder holds 2 onz of nectar and has 4 feeding ports. It has special built-in ant moat. This feeder really is easy to clean - top-shelf dishwasher-safe. And easy and to fill. And it is steady and dripless even in high winds. I love that the whole thing is made of polycarbonate which makes it much more durable than the usual plastic feeders which only seem to last one season. I also like the fact that it is pretty - it's almost like an ornament hanging on the porch. And best of all, the hummingbirds love it because they can perch and rest while they feed. The Perky Pet hummingbird feeder is made of hardened glass bottle, is clear and shatter-proof. It has 4 feeding ports with built-in bee guards and a 4-way perch and holds 8 ounces of nectar. The feeder unscrews easily from the feeder base for quick cleaning and filling. I love this feeder and, more important, so do the hummingbirds! I like that it is inexpensive and the birds lap up my homemade nectar. One little moan - it has many small parts which means that it takes time to take the feeder apart, get all the parts clean, and reassemble it. For the price and the entertainment value, it's been money well spent. Hummingbird Books to make your hummingbird watching even more interesting. Follow my hummingbird food recipe for a simple nectar. Also filled with useful tips on cleaning hummingbird feeders. Plant a hummingbird-friendly garden with plants for hummingbirds. You will make the hummers happy and have a gorgeous garden. 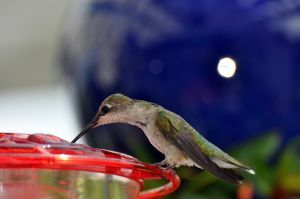 Plants that attract hummingbirds will also help the birds to find your best humming bird feeder in your garden. Humming Bird Information contains lots of facts about these lovely little birds. See how much you know! Among the most common hummingbirds along the USA Pacific Coast. Mostly green and gray, without any rufous or orange marks on the body. The male's head and throat are covered in iridescent reddish-pink feathers that can look dull brown or gray without direct sunlight. 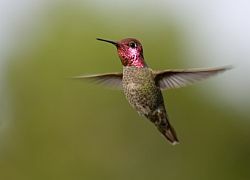 With their emerald feathers and sparkling rose-pink throats, they look like flying jewellery. No larger than a ping-pong ball and no heavier than a nickel. Their thrilling courtship displays see males climb up to 130 feet into the air and then swoop to the ground with a burst of noise that they produce through their tail feathers. Common in yards, parks, residential streets, eucalyptus groves, riverside woods, savannahs, and coastal scrub. They readily come to hummingbird feeders and flowering plants. Anna’s don’t migrate much, so don’t be surprised if the bird visits your feeder all year long. The female builds the nest out of plant down and spider webs, sitting in the nest and building the cup rim up around her. Usually in a shrub or tree, or in vines or on wires.